I'm not really a video game t-shirt guy, nor am I a Zelda guy. But I do think this shirt is pretty good because it's slightly obtuse. 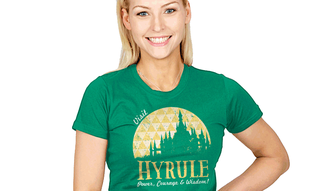 Obviously we know what it means to visit Hyrule is but not everybody who might see you walking around with this design on your chest or the back of your hoodie would. Pictured above is one of three Ript Apparel designs that are available for today only. The other two are also Zelda things but are more obviously video game-y. Hyrule tourism is the best of the bunch, easy. But you should decide for yourself because doing that is why being human might be cool someday.